I’ve a dairy grazing friend who has long thought of himself as being nothing more than a peasant. A rather interesting view, I’ve thought, given that this man has made a fair amount of money operating at a scales far beyond those of the traditional midwestern dairy farmer. His house is nicer than mine. A peasant he probably is, though, if one considers the size and clout held by agriculture’s true power brokers. ConAgra, Cargill, Monsanto, Smithfield/Shuanghui — an individual farmer cannot stand up to the likes of these behemoths no matter how many acres he might till or cows he can milk. One need look only at the history of our agricultural policy: What was once concerned primarily with keeping individuals on the land has morphed into something that is almost entirely about keeping food flows and processing/marketing profits on the upswing. We are told that this must be done in the name of feeding the world. I’ve deleted a billion bits and bytes worth of electronic press releases — almost all of them funded by Big Agbiz — telling me that I would starve without the modern methods of making meat and milk, corn and soybeans. Bill Gates says we can’t save Africa without genetic engineering. Most every well-paid “futurist” out there is warning that if we don’t splice more genes, use more fertilizer and do everything else Agbiz promotes to achieve higher yields, we’ll have mass starvation by mid-century. The bottom line in all of this is that we’re going to have 10 billion people on this Earth by 2050, so we had better give Big Agbiz free rein to splice, pollute and conglomerate. We had also better provide these entities with a lot of public subsidies if we want food on the table a few decades down the road. We’re already short on vittles — just look at the one billion people who don’t get enough to eat today. Every bit of this is a big lie. According to a 2009 United Nations Food and Agriculture Organization report, the world already produces enough food kilocalories to feed a population of 10 billion. Other organizations have estimated that we currently produce enough to feed 11 billion souls. Some even put the number at 15 billion. If that’s true, why are people going hungry? The answers are well-documented. It’s been estimated that more than 30% of all food is wasted in a variety of ways from the field all the way to the uneaten broccoli on your child’s plate. More than 40% of U.S. corn production is going to energy production and, no matter what the corn growers might try to make you believe, the byproducts of that production are producing nowhere near the food energy offered by the original kernel. More than a third of our grains go to livestock, including cattle with their abysmal feed conversion ratios. War, corruption, graft, broken transportation systems — all these and more contribute to hunger around the world. Make no mistake, the “feed the world” propaganda is less about ending starvation, and much, much more about maintaining stock values, executive bonuses and the power status quo. Meanwhile, we’re fouling our collective nest. There is greater evidence of this from around the world, but allow me to mention four instances closer to my home. Green Bay in Lake Michigan has developed a “dead zone,” with 70% of the problem pegged to agriculture. Hormones are being found in rural wells in eastern Wisconsin, with CAFO dairies by far the likeliest source. Backwaters of the Wisconsin River have become fouled by nitrates leached from nearby farm fields. And the chain of lakes in my county has just been declared a “impaired,” with agriculture judged to be 70% of the cause. To solve this problem, our county government has spent my tax dollars in building two, multi-million dollar biodigesters — the first of which recently sprang a leak that unleashed 300,000 gallons of raw manure across the countryside. Meanwhile, and despite all of the talk about the greatness of modern corn, yields have been below long-term trend lines in most recent years. I suppose a perfect weather year and/or a collective decision to stop digging up every rocky hillside to plant the stuff would help the per-acre average, but I’m not holding my breath here. The fact of the matter is, as Gabe Brown says, “We are all farming degraded resources.” Current monoculture farming methods are fighting Mother Nature to an ever-increasing degree, and that spells trouble. I’ll make this statement: By mid-century, AgBiz attempts to ramp up agricultural production by juicing current methods may be causing more starvation than they are preventing. We peasants have far better ideas. Merriam-Webster’s online dictionary says we are “a poor farmer or farm worker who has low social status.” Wikipedia claims we’re “a member of a traditional class of farmers, either laborers or owners of small farms …” I figure we’re people who make do with what we have, using homegrown and local resources rather than prescriptions and products made in laboratories to produce competitive yields and superior quality. We treat the resource based on long-term goals rather than short-term yields. Big AgBiz scoffs, of course, pointing in particular to a study published in 2001 warning that organic agriculture requires twice the land of conventional to produce the same amount of food. For one thing, peasant agriculture doesn’t have to be strictly organic. A long-term trial out of Iowa State University showed that crop rotations including forages and a bit of agrichemical use outyielded monocultures of corn and beans. And even true organic can pull the same trick, as shown by a long-term trial on Rodale Institute plots. These kinds of performances are happening even though organic and other forms of peasant agriculture have received almost no institutional support for many, many years. Meanwhile, New York Times writer Mark Bittman recently cited research indicating that the industrial food chain uses 70% of agricultural resources to provide 30% or the world’s food, while peasants are producing 70% of the food with 30% of the resources. Of course peasant agriculture requires hands, brains and farm-specific knowledge rather than capital, machinery and prescriptions. Backaches are no fun. At 18 years of age I wasn’t real eager to continue forking hog manure. A lot of the culture has changed since then, so reenacting the old days is not likely to happen. But peasant agriculture and change are not contradictions, as evidenced by the improvements that graziers have made to their craft over the past couple of decades. I have few doubts that graziers and other peasants around can feed the world at mid-century while improving soil health, reducing environmental degradation and producing high-quality foods. We can bring back crop rotations and high-forage livestock rations, in the process saving grains for direct human consumption. 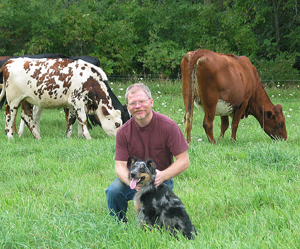 We can alter our breeding a bit with the idea that grazing dairy animals can also provide quality beef. In accomplishing this we can employ renewable resources — including humans — instead of fossil fuels and machines. The power structure is against us. China is in the process of uprooting 250 million peasant farmers and sending them to the cities in an effort to create a bigger consumer culture. Yet we are the only hope to feed the world in a way that does not destroy it. Peasants from Alabama to Africa will be doing the heavy lifting here. Take pride in your role in this effort, the most important we’ll be undertaking in the coming years. 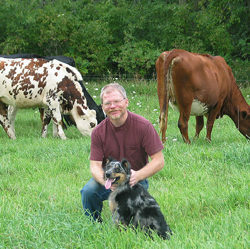 In addition to publishing Graze, Joel McNair grazes dairy heifers and sheep on a small farm in southern Wisconsin.